As I was watching the BBC text of the final moments of our last warm up game this morning & the conclusion of yet another draw, thoughts began to turn towards the test match on Thursday. As is my eternal habit ( well except for those trips to the West Indies back in the 1980's) my optimism that we may achieve our first series win in India since the 1884/85 tour is suitably delusionaly sky high. Jonathan Trott's century in the 2nd innings against Haryana ( ignoring the fact that this wasn't top class opposition) means now that all of England's potential top order have found some semblance of form in these warm-up matches. Of course, things will be rather different in the Tests…… well except for the baking heat and flat- as -a - pancake pitches that are enough to make any fast bowler weep into his breakfast bowl. For a start our batsmen have to finally come up against India's specialist spinners. Conspiracy theorists will be interested to know that Amit Mishra didn't bowl at all in the second innings for Haryana. The 'spinning' issue also took a strange turn last week when the customary shy and retiring Graham Swann decided to speak out about India's spinners saying that we had nothing at all to fear from them……Great, well done Swanny. Thank god that pre-series predictions have never blown up in our faces before eh?……er? The selection headache still revolves around the bowlers with Bresnan, Meaker and Panesar all picking up wickets and staking a place for Thursday's match. Finn at least had no adverse reaction to bowling off his full run and with Broad apparently successfully testing out out his bruised heel by bowling in the nets for the first time makes it all the encouraging for England, but doubts still remain as to whether he and Finn can get match fit before Thursday. Cook confirmed afterwards that he wouldn't risk either of them unless they were 100% - though the fact that Broad is now vice-captain makes him pretty much a shoe-in even if there is still a small doubt of his fitness. The big question ( well for me it is, I don't get out much) is the choice of opener. If my opinion was worth anything - which thankfully it isn't as my " What the hell is Andy Flower ever going to do as coach for England?" statement will quite clearly testify to - Mr Compton may be the ideal choice to open with Cook - but don't let anyone know I said that eh?….i don't want to curse the boy before his Test career has yet begun. BTW, the final warm game has just finished - shock, horror……. it was a draw. Well that's the first of the warm up games and it seems that some semblance of normality is returning to life as an England cricket fan. In other words some things never really change. KP returned to the England side for the first time since 'Textgate' and was back to doing what he can do best - a quick fire explosive innings with lots of 'oomph' …..…...then getting himself out to spin. Then there was the mandatory injury scare to one of our potential 1st team players - this time it was the turn of Steve Finn's name to come up on the injury scare roster after straining his right thigh. The rumour that this was done shortly after he received a text from a Mr A. Strauss asking him to give a certain team-mate a good kicking has yet to be confirmed. In the name of fairness I must keep that player's identity anonymous and rearrange the initials of his name to PK. Yes there was a good deal to be positive about after the 1st warm up game ended in a draw. Cook and Patel scored a hatful of runs and our bowlers had a good run out. Though our inability to knock over the lower order once again when the hard work has been done up front reared its ugly head. India A were reduced to 190 for six after lunch on the opening day of the first warm-up match only for a 110 run seventh-wicket partnership. We need to re-learn the art of keeping ones foot on ones opponents throat. Perhaps the best sign of normality returning was the news that the broadcasting issues with the Indian authorities have now been resolved. Funny that. 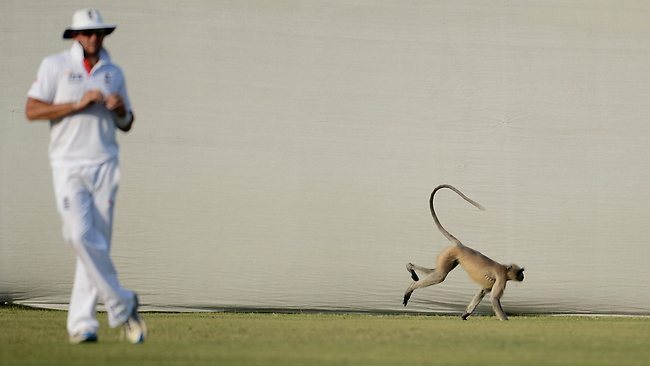 It had been feared the Test Match Special team would be denied access because of a demand for a reported £50,000 facility fee. It has not been disclosed whether the BBC has agreed to pay more to cover the four-Test series. According to the to BBC "Test Match Special will broadcast England's cricket tour of India from the grounds after agreement was reached with all parties," a spokesman said. So in celebration ( or in some cases, that could be commemoration) of the prospect of full & live commentary from both Sky and Test match special, here is my short musings on some of the names that we all know from the wonderful world of Cricket commentary and analysis. Soon be assaulting our senses in the next few weeks. Nice guy, one of my all-time cricket heroes who finally after all these years seems to be growing into his hair. He does have the habit of asking questions and making points in 175 word - sentences when just 10 or so words could do the trick, but otherwise a solid and dependable anchor. Again, one of my all-time cricket heroes, in fact probably THE boyhood sporting hero of mine. However he seems to have taken up the mantle that Fred Trueman had on TMS, namely regularly spouting how better/fitter/faster/entertaining/less likely to bowl no-balls etc etc they were in their day. Also, someone should tell Ian that it's all right to agree occasionally with the Captains field positions and that his actual captaincy record of played 12 - lost 12, is actually pants. I once remember him saying towards the end of his fine playing career that the last thing he wanted was to be another ex-England captain constantly criticising the current one on tv. Well he's actually rather bloody good at what he does, always fair to the England captain, gets to the point and doesn't just say things to be confrontational. He does have one annoying habit of continually talking & laughing off-microphone to whoever is also in the box - so stop it, it's rude. Often given the job as resident clown in the commentary box but is far more knowledgable than sometimes given credit for. Yes he is probably certifiably insane but he's also a gifted speaker and always fair. Terrifically entertaining. Staring at the camera with that 'smile' on your face is creepy Bob. Stop it. A terrific commentator and broadcaster, the perfect successor to Brian Johnson whom he worshipped. More acerbic and controversial though than Jonners ever was, but a true broadcasting professional who would have succeeded in any cricketing era. I don't know much about buses, but what i do know i've learnt from listening to 'Blowers' describe them as they pass the ground during commentary on the radio all these years. A true thow-back to a bygone cricketing era, always charming, enthusiastic, knowledgable and entertaining. Oh Geoffrey, a shy, retiring, a man with a million friends in his profession and always polite Geoffrey. Well thats enough of my uncle, Geoff Taylor. Onto Mr Boycott. Yes, another cricketing hero and often much maligned. He is often rude, he is often prone to 'betting his house' on a result, likes to bash the Aussies ( not such a bad thing) and doesn't half bang on about his corridor of uncertaintly. But I love him.